September 17 is the deadline for submissions. Have you sent yours? The clock is ticking. 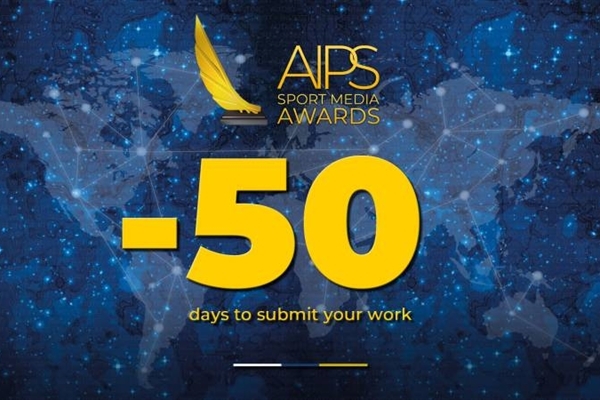 We are only 50 days away from September 17, the deadline for submitting your work for the AIPS Sport Media Awards. And we have decided to celebrate it with 50 things you must know about the Awards. 1) Submission is completely free. Just sign up at www.aipsawards.com and submit your work. 2) Everyone can send up to two submissions across all categories. 3) There is time to submit until September 17, 2018. All works need to have been published between July 1, 2017, and September 17, 2018. 4) Categories are divided between Writing, Photography, Audio, Video and Weblogs. 5) Writing has two subcategories: Best Column and Best Colour Piece. Best Column: a piece that best demonstrates relevance, knowledge and authority in the field of sport writing. Best Colour Piece: a piece that best captures the emotion and sense of occasion in and around the sporting world. 6) Photography has two subcategories: Best Action Picture (1 photo) and Portfolio (3, 4 or 5 photos). The portfolio entries may be from the same sport or same event, or from different events and different sports. 7) Video has two subcategories: Athlete profile and Documentary. Athlete profile: a video that portrays a captivating, in-depth image of an athlete. Documentary: a video that tells a compelling and revealing story about any aspect of the sport world. 8) Audio category is open for submissions from radio, podcasts, or just the audio file taken from audiovisual platforms (video, TV). 9) Sport blogs can compete in their own category. The capacity of building a community and engaging readers will be taken into account, but each blog needs to submit at least one entry. 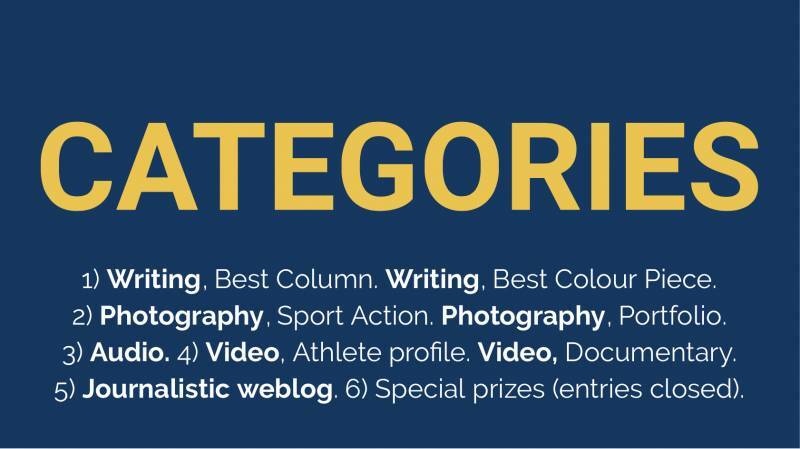 10) There are two special categories not open for submissions: Investigative reporting and A life in sport. These special categories will not have finalists: winners will be directly informed in advance by the jury. These categories are not entitled to a money prize. 11) A jury of 10 relevant members of the sport media industry, plus AIPS president Gianni Merlo, will select the three finalists for each category or subcategory. 12) There’s a total of US$ 104,000 for all the finalists. 13) The winners of each category (or subcategory, where applicable) will be entitled to a money prize of US$ 8,000. 14) Second-placed will earn US$ 3,000. The third-placed will be rewarded with US$ 2,000. 15) There are no restrictions for languages. All languages are accepted in the submissions. 16) The final gala will take in Lausanne, Switzerland, on January 2019. A reminder of the categories and subcategories. 17) The website www.aipsawards.com has received visitors from 127 countries since its launch in April. 18) The rules and details of the Awards are available in the website in five languages: English, Spanish, French, Arabic and Russian. 19) All finalists will be announced by AIPS in advance. They will have to be present in Lausanne in order to claim the prize. 20) For those selected as finalists, transport and accommodation to the final gala in Lausanne will be fully covered by AIPS. 21) Promotion of the AIPS Sport Media Awards started in Pyeongchang, for the Winter Olympics 2018, and continued in South America, Europe, Africa and the Middle East. 22) All participants need to be at least 18 years old before July 1, 2017. 23) There is no obligation to be an AIPS member to participate. However, all submissions need to be from one of the 160 countries that are part of the AIPS network. You can check the full list of countries in the AIPS website. 24) Journalists can be employees of a media outlet or work as freelancers. 25) In the case of photographers, they need to show proof of a professional status. 26) Proof of publication is needed when submitting your work. It can be a link or a PDF, MP4 or audio file, depending on the category. 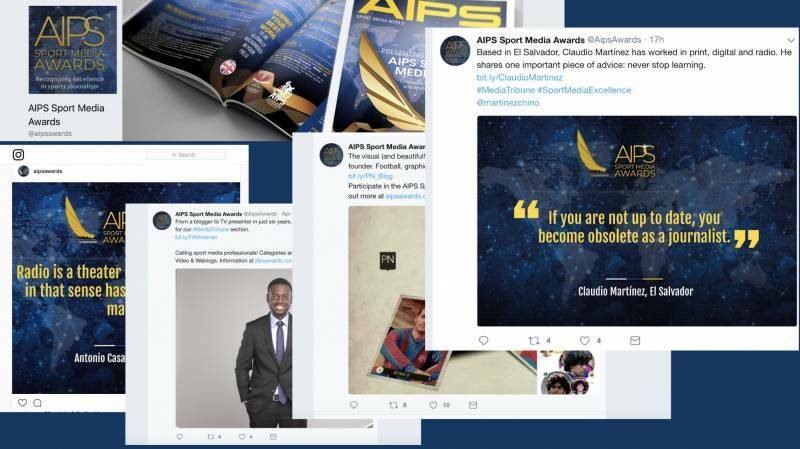 27) The AIPS Sport Media Awards are a celebration of sports media excellence, representing a new, inspiring horizon for sports journalists across the world. 28) The AIPS Sport Media Awards are present on Facebook, Twitter and Instagram with dedicated accounts. Please follow @aipsawards for interesting content, reminders and advice. 29) Our hashtag is #SportMediaExcellence. The Awards social media accounts will be celebrating those professionals who continue to produce the best, most creative content worldwide. 30) To understand how the world of journalism is evolving, we have been proposing a series of contents called Deconstructing the Profession, to be shared across all platforms. 31) Media Tribune, Game Changers, Editor Speaking and Media Trends are part of the Deconstructing the Profession package. 32) By sharing these kind of stories, we look forward to celebrate Sport Media Excellence not just once a year in a fancy gala, but every day. "Deconstructing the Profession" package. Inspirational stories from around the sport media world, available in our website and social media accounts. 33) The AIPS is the body that represents international sports media from websites, newspapers, radio and TV across all continents. 34) There are currently 9,000 AIPS members worldwide. 36) The creation of the AIPS Sport Media Awards is yet another step in the constant evolution of AIPS, whose first Congress was held in 1924 on the eve of Paris 1924 Olympic Games. 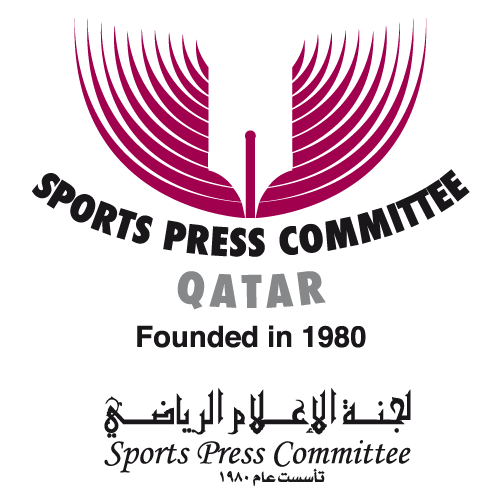 37) AIPS will partner with QSPC, the Qatar Sports Press Committee, for the AIPS Sport Media Awards. 38) QSPC is offering broad support to AIPS as part of a shared drive to invest in culture and sport journalism, and purposefully protect and safeguard the integrity of the profession. 39) In order to submit your work journalists and photographers are required to sign up and create a profile at www.aipsawards.com, which is as easy as signing up for an email account. 40) Submissions should only be made via www.aipsawards.com before September 17th, 2018. Submissions will not be accepted by email, social media or any other platform. 41) The AIPS Executive Committee members will screen all submissions and shortlist the best of them, that will qualify for the second phase. 42) The Jury will base its deliberations on nominations put forward by the AIPS Executive Committee and select the three finalists of each category, that will be invited to Lausanne in January 2019. 43) The Jury will meet to determine the winners one day before the ceremony. 44) Entries and information contained within any entry (including supporting documents) must have been obtained legally, must not infringe any copyright or other intellectual property rights, must not be defamatory or breach any privacy law, and must not breach any other law or regulation. 45) The photographs entered in the contest must be made by the photographer who owns and retains the copyright for the photo. A photograph may not be entered more than once, i.e. a photo entered into the Action category cannot be entered into the Portfolio category and vice-versa. 46) No team entries will be accepted. 47) Photographs may not be manipulated to block out distracting elements or to make significant changes in color and contrast. Only cropping or removing dust and scratches are allowed. 49) Have you submitted your work yet?